Created by leading fertility expert Dr. Amos Grunebaum. Perfect while trying to conceive, during pregnancy, and while breastfeeding. Contains the “Just Right” balance of vitamins and minerals for women, including Folic Acid. Very small in size so they are easier to swallow and gentler on queasy stomachs. One bottle provides 60 Tablets – a two month supply! 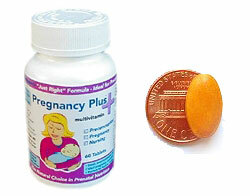 Purchase Pregnancy Plus Prenatal Multivitamin from our retail website, BabyHopes.com. Designed to meet a woman’s unique nutritional requirements before, during, and after pregnancy, Pregnancy Plus prenatal vitamins provide the Recommended Daily Allowance of key vitamins in a natural formula that is free of artificial colors or flavors. This makes Pregnancy Plus the natural choice in prenatal vitamin supplements. And because Pregnancy Plus comes in small, easy-to-swallow tablets (one tablet per day), it’s much easier to take than other oversized prenatal supplements. Folic Acid (part of the vitamin B family) is very important for a strong pregnancy and healthy fetal development. Folic acid has been shown to decrease the risk of birth defects like spina bifida or other neural tube defects. It is recommended that women increase their intake of folic acid even before trying to conceive. – and with a “just right” formulation of folic acid (600 mcg), Pregnancy Plus prenatal vitamins provide the ideal dosage for pregnant and trying-to-conceive women. Folic Acid is a water soluble B-vitamin – which means that it does not remain in the body for very long, so a regular, daily dosage is required. During pregnancy, the body’s requirement for this vitamin increases and Pregnancy Plus helps you meet these new prenatal nutritional needs. According to studies of pregnant women, taking the B-vitamin folic acid may reduce the risk of neural tube defects by up to 75% – and that makes vitamins like Pregnancy Plus an important part of prenatal nutrition. Like Folic Acid, iron is essential to a health pregnancy. Iron is the central component of hemoglobin, the part of the blood that carries oxygen. Iron helps blood cells carry oxygen to you and your developing baby, supporting energy, healthy growth, and strong teeth and bones. Many women do not get enough iron even when not pregnant – so when you do conceive, the need for this mineral increases. Pregnancy Plus prenatal vitamins provide enough iron for you and your growing baby. Not all Vitamin A is the same – and high doses of Vitamin A derived from retinol palmitate can actually be unhealthy. That’s why the Vitamin A in Pregnancy Plus vitamins is 100% beta-carotene – balanced for a safe, once-daily dose from preconception through pregnancy and nursing. Vitamin A is central to healthy embryonic development, cellular and tissue growth, the healthy development of eyes, hearts, ears, skin and mucous membranes. It also assists in resisting infections and repairing tissue. For preconception, Vitamin A sustains a healthy reproductive cycle. During lactation, Vitamin A helps replace maternal Vitamin A lost during breast feeding.